Aoao Video to Picture Converter is software used to convert video file like AVI, MPG, WMV, MKV, MOV, MP4, 3GP, RMVB to picture files like JPG, GIF, BMP, TGA, TIF, PCX, Ico, etc. Can also be used to capture single picture from video. 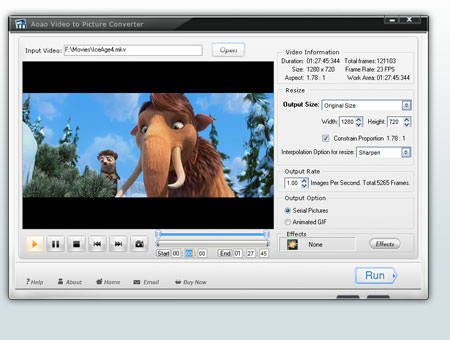 If you need more information please contact the developers of Aoao Video to Picture Converter (AoaoPhoto Digital Studio), or check out their product website.